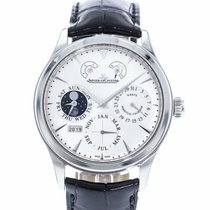 Jaeger Lecoultre Master 8 Days Perpetual Calendar Watch 174.8.26 Q174826S. Manual winding movement, Caliber 876, 37 jewels. Stainless steel case 40.0 mm in diameter. Exhibition case back. Concave lugs. Fixed stainless steel bezel. Scratch resistant sapphire crystal. Silvered matte dial, raised dagger numerals, three engine-turned subsidiary dials for date, month and day combined with moon phases, aperture for four digit year display, two fan-form sectors for power reserve and day and night indication combined with the aperture for security zone indication. Black alligator leather strap and with stainless steel deployent clasp.